Your dog is more than just a pet; he’s a member of your family. That’s why you go to great lengths to ensure that you provide him with the very best of care. He’s fitted with the most comfortable dog collar, has the most supportive dog bed, has a slew of interactive dog toys to keep him happy, and has the most secure dog crate to keep him safe and sound. While all of these products will certainly help to ensure that your pooch lives his best life, there’s one product that is more important than all of the rest: his dog food. Animal nutritionists and veterinarians encourage pet parents to choose the highest quality dog food brands to ensure that their furry companions are receiving the very best nutrition to meet their unique dietary needs. While there are certainly a lot of dog food options to choose from, trying to narrow down the field and pick something that you will have confidence in can be tough. Unfortunately, not all dog food choices are made with premium quality ingredients and offer the nutrition that canines need. However, there are many brands that do feature the best ingredients and offer balanced nutrition, and Pedigree dog food is one of those brands. But, Pedigree makes so many different formulas, which can make it hard to decide which option to feed your furry best friend. With the help of a team of experts, we’ve narrowed down the choices to what we think are the top five Pedigree dog food formulas. Why Consider Feeding Your Pet Pedigree Dog Food? Now that you have seen our top choices for the best Pedigree dog food recipes, let’s investigate each option in more detail. Below, we offer in-depth reviews of each formula, including the ingredients that they contain, what we like about them, and what we found pet parents had to say in the Pedigree dog food reviews we have read. After you reach through each description and decide which formula you think will best meet the needs of your pooch, click on the buttons to find the best prices currently available on Chewy and Amazon. Whether you have an adult German Shepherd, Mastiff, Collie, or Pug, feeding him Pedigree Adult Dry Dog Food will help to ensure that he is getting all of the vital nutrients that he needs during this stage of life. This dry dog food offers complete balanced nutrition for adult dogs. Featuring real animal protein that is sourced from roasted chicken, you can rest assured that your pooch will receive the protein that he needs to support the health of his muscles and joints. It also contains optimal levels of Omega 6 fatty acid, which helps to nourish his skin and keep his coat shiny and fully. A precise blend of antioxidants will combat oxidative stress caused by free radicals and can prevent various health conditions that adult dogs can suffer from, such as cognitive decline and muscle loss. Whole grains and fiber make this formula easy to digest and improve the digestive health of your pup. This formula is completely free of additives, like high fructose corn syrup, artificial flavors, and sugars, so your pet will be getting all of the good stuff that he needs and none of the bad stuff that he doesn’t. Final Verdict: For complete balanced nutrition for your adult dog, Pedigree Adult Dry Dog Food is a great choice. It is specially formulated to meet the dietary needs of adult dogs of all breeds and sizes and will ensure that he gets the nutrition that he needs to thrive. Most pet parents are very pleased with the product. For adult small breeds, like Chihuahuas, West Highland White Terriers, Scottish Terriers, and Cairn Terriers, a food for small dogs is an absolute must. 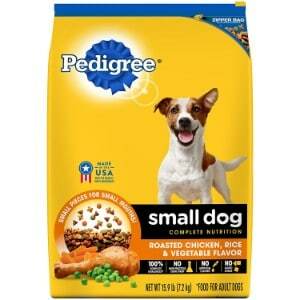 Pedigree Small Breed Adult Dry Dog Food will provide your canine companion the nutrition that he needs to thrive. This recipe is specifically formulated for adult small breeds, as it has a higher fat and calorie content than the standard Pedigree Adult Dry Dog Food, which smaller dogs need to maintain their high energy levels. The roasted chicken, rice, and vegetable flavor is very palatable to pooches, according to pet parents, and the smaller sized kibble is ideal for those petite mouths. This formula is fortified with a precise blend of vitamins, minerals, and antioxidants, which will help to support your small furry pal’s active lifestyle. The addition of whole grains will make this formula easy for a tiny tummy to digest, and the omega 6 fatty acids will nourish your pet’s skin and keep his coat shiny, full, and luxurious. According to pet parents, Pedigree formula offers complete balanced nutrition for small breed pooches. And, like all products made by this manufacturer, it is completely free of additives, like high fructose corn syrup, artificial flavors, and added sugars. Final Verdict: Many pet parents of adult small breed dogs rely on Pedigree Small Breed Adult Dry Dog Food to provide their four-legged family members with the nutrition that they need. It’s specifically formulated for petite sized dogs and will offer them the vitamins, minerals, and nutrients they need to maintain an active lifestyle. Just like people, it’s unhealthy for canines to carry extra weight. Overweight dogs are more prone to a variety of health conditions, such as joint problems, diabetes, and cardiovascular disease. If your pooch has packed on a few pounds or you simply want to ensure that he maintains a healthy weight, you should consider feeding him a dog food for weight loss. Pedigree Healthy Weight Adult Dry Dog Food is specially formulated to help your pet maintain his sleek physique so that he remain in the best health possible. This formula is ideal for adult dogs that aren’t as active as they used to be, or who tend to be overly zealous at mealtime. 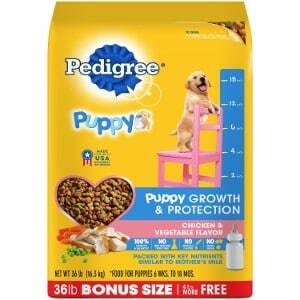 A low fat formula, this Pedigree dog food will help to keep your pet lean and at his ideal weight. The calorie content is also lower than other Pedigree dog food formulas, which further supports weight loss. And, the addition of special fiber will keep your dog feeling fuller longer, so won’t feel like he has to eat as much. Packed with essential vitamins and minerals, like vitamin E and antioxidants to strengthen the immune system, and omega 6 fatty acids to enhance the health of adult dogs’ skin and coat, this formula will ensure that your pet is getting everything that he needs to maintain a healthy lifestyle. Final Verdict: If your dog adult dog is overweight or isn’t as active as he used to be, Pedigree Healthy Weight Adult Dry Dog Food will help to keep his weight on-track. This low fat formula features a specialized blend of fiber to make your pet feel fuller longer and contains healthy vitamins and minerals for balanced nutrition. For adult dogs who are picky eaters or who have a hard time eating kibble, a premium quality wet dog food is a great alternative to dry food. 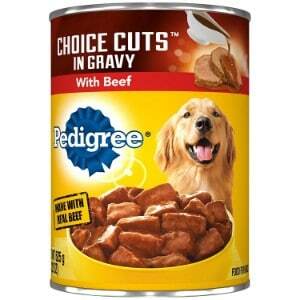 Pedigree Choice Cuts in Gravy with Beef Adult Canned Wet Dog Food will help to keep your pet satisfied and offer him the nutrients that he needs to maintain a healthy lifestyle. This recipe is made with real beef, which has been slowly stewed in gravy, to create a highly palatable taste and texture that canines love. It’s more similar to the taste and texture that your domesticated dog’s ancestors ate, so it will satisfy his taste buds. Plus, if your adult dog has issues with his teeth and has a hard time chewing dry food, he’ll have no trouble chomping down the tender morsels in this formula. This hearty canned food is also infused with essential nutrients, like vitamin E, biotin, thiamin, vitamin D, and magnesium to support his overall health and well being. The majority of the Pedigree dog food reviews that we read indicated that pets’ love this wet food and have no trouble eating it. Final Verdict: If your adult dog is a finicky eater or he has a hard time eating dry kibble, consider feeding him Pedigree Choice Cuts in Grave with Beef Adult Canned Wet Dog Food. It’s made real cuts of beef and gravy, and offers balanced nutrition for adult dogs of all breeds and sizes. Puppies have unique dietary needs, as they require a perfect balance of certain vitamins and minerals that will support healthy growth and development. Pedigree Complete Nutrition Puppy Dry Dog Food is made specifically for puppies that are 1 year and under and will offer your pooch the nutrition that he needs to grow healthily into an adult. This dry food recipe offers the perfect amount of calcium and phosphorous, ingredients that will help to strengthen the teeth and bones of your developing puppy. It’s also formulated with DHA to promote proper brain development, which is extremely important for puppies, and has a wealth of vitamins, minerals, and antioxidants to help nourish your pup from his coat to his digestive system. This formula contains no high fructose corn syrup, artificial flavors, or added sugars, so you can rest assured your pooch will receive the best quality food. And thanks to the chicken flavor, your pet will gobble it right down. Final Verdict: Puppies require a specialized diet that contains the nutrients they need to flourish, and Pedigree Complete Nutrition Puppy Dry Dog Food will provide your puppy with the perfect blend of nutrients. Fortified with DHA and calcium, you can have confidence knowing that your young pup will receive the nutrition that he needs while he’s developing during puppyhood. There are so many different pet food brands to choose from; Natural Balance dog food, Merrick dog food, Diamond Naturals dog food, Wellness dog food, and Hill’s Science Diet dog food are just some of the different options that are available. With so many excellent choices, it can be hard to decide which one you should go with. Of course, feeding your pup a well-balanced diet that will not only meet his nutritional needs, but that he will also thoroughly enjoy eating, is your top priority. Of all the different dog food brands that are available, countless pet parents have entrusted Pedigree dog food to offer their canine companions the nutrition that they need. 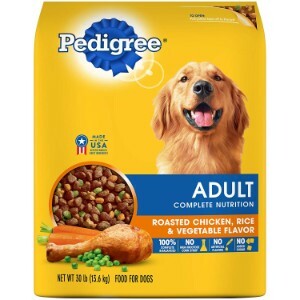 If you’ve recently adopted a dog and have never purchased pet food before, or if you are looking to switch brands, you’re probably wondering why Pedigree dog food ratings are so high among pet owners, veterinarians, and animal nutritionists. In this portion of our guide, we’ll shed some light on this dog food manufacturer so you can determine if Pedigree is the right choice for your pup’s needs. Pedigree was been around for quite some time; 1932, to be exact. First, it was called “Chappie” after the Chappel brothers who created it in Manchester, England. In the beginning, the food was made from low quality protein sources and other poor quality ingredients. Their intent was to offer pet parents with an affordable food option for their dogs. Eventually, the name was changed to Pedigree, and they also changed their formulas so that they included high quality ingredients to provide better nutrition, but still at affordable prices. Pedigree is one of the most popular dog food brands on the market. Countless pet parents rely on this dog food to feed pooches of all ages and sizes at an affordable price. If you are looking for a high-quality food but you have a low budget, then Pedigree dog food will certainly appeal to you. In fact, it’s the affordable price tag of their dog food products that many pet owners find so appealing. But more importantly than the price, this brand of dog food is made of quality ingredients, so it provides balanced nutrition for canines. In fact, pedigree complies with some of the most stringent food safety requirements, like the Association of American Feed Control Offices (AAFCO). While the quality of the ingredients may not be on-par some other brands of pet food, like Blue Buffalo dog food or Rachael Ray Nutrish dog food, Pedigree certainly does live up to the standards that have been established for dog nutrition. In fact, veterinarians and animal nutritionists often recommend Pedigree products. Offering a wide range of formulas, all of which are infused with essential vitamins and nutrients, and at a fair price, when it comes to feeding your four-legged family member, Pedigree is certainly an option that is worth considering. However, there are some points to note: Pedigree does use animal byproducts in their formulas, as well as gluten-based products. So, if your pet has food sensitivities or digestive disorders, keep this in mind when you are shopping for food. 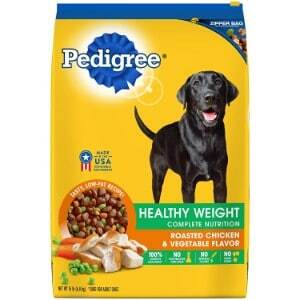 Nevertheless, Pedigree is still one of the most trusted pet food brands on the market. As we mentioned, Pedigree offers a variety of dog food formulas that are made for dogs of all sizes and all life stages. So, how did we narrow down the options to just five? We wanted to provide our readers with food choices that would meet some of the most common needs. We also enlisted the help of animal nutritionists and veterinarians, who helped us analyze the ingredients. Furthermore, we read through dozens of Pedigree dog food reviews to see what pet parents who have used these products had to say. Our research helped us pick, what we consider to be, the top five formulas from Pedigree. Each option is specially formulated to meet the needs of specific dogs, and offers balanced nutrition for optimal health. When it comes to choosing a pet food, you definitely have a lot of options to consider. But, if you are looking for something that adheres to strict food safety regulations, offers the nutrition that your pet needs, and won’t break the bank, then Pedigree dog food is an option that we strongly recommend. While the ingredients featured in their products may be inferior to the ingredients used in other brands, this dog food brand is certainly a safe choice for dogs of all ages and sizes, and will most definitely meet your pet’s needs. The five Pedigree formulas featured on our list are among the best that this brand has to offer; but, you can feed your pet any of the Pedigree recipes and have confidence knowing that he will be getting the nutrition that he needs.